Guess what?! I finally finished one of the Diva's challenges in time to post it! Shocking I know, as it has been a long time. I've been checking in every week, and I've even started some, but I've either not finished them or not finished in time. So, I tried really hard to get mine completed this week. Following The Diva's example, I too chose to do a zendala. I don't have any of the nifty tiles though, so I made my own. 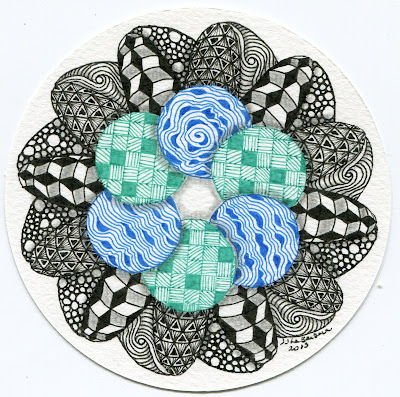 I used my circle cutter and cut out a 4" circle on watercolor paper. I then traveled over the Erin's site The Bright Owl, and pulled my template from Challenge #52. Being Earth Day, I wanted a template with circles in it and this one jumped out at me. I knew that I wanted some blue and green on the zendala, so I decided that I'd use them in the middle. I picked Diva's Dance in blue to be my "water". For my "earth" circles, I just kind of made it up. I wanted to have something that looked like fields from above. I started with squares and then just filled them with rotating patterns or filled the space with just green. I'm not sure how I feel about the design as a tangle pattern, but it works here for what I was aiming for. Now, I needed to do the outer sections. Again, I wanted to have patterns that felt organic or earthy to me. I used Beeline because, bees! The other sections are Zin, mostly because I messed up my Beeline set up. But hey! 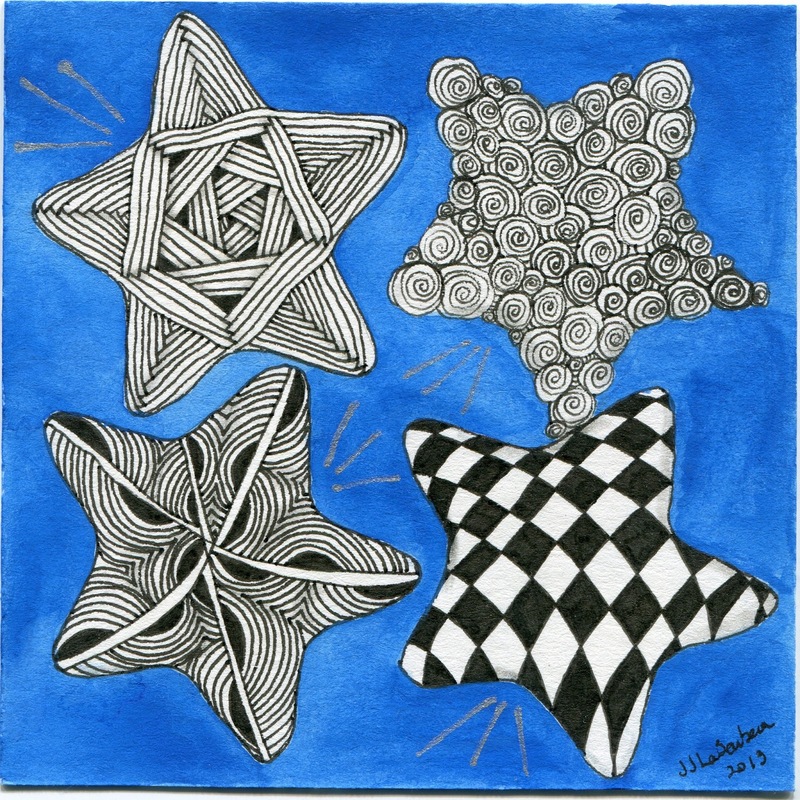 There are no mistakes in Zentangle. I had these lovely triangles and Zin fit in perfectly. The outer edges I used Verve and Tipple. I thought that Tipple looked like gravel or a rock pile. After that, I added a little shading and BOOM! I was done. I really wasn't sure how it would turn out when I got started, but I am pleased with the final result. As is often the case, shading helped a lot. 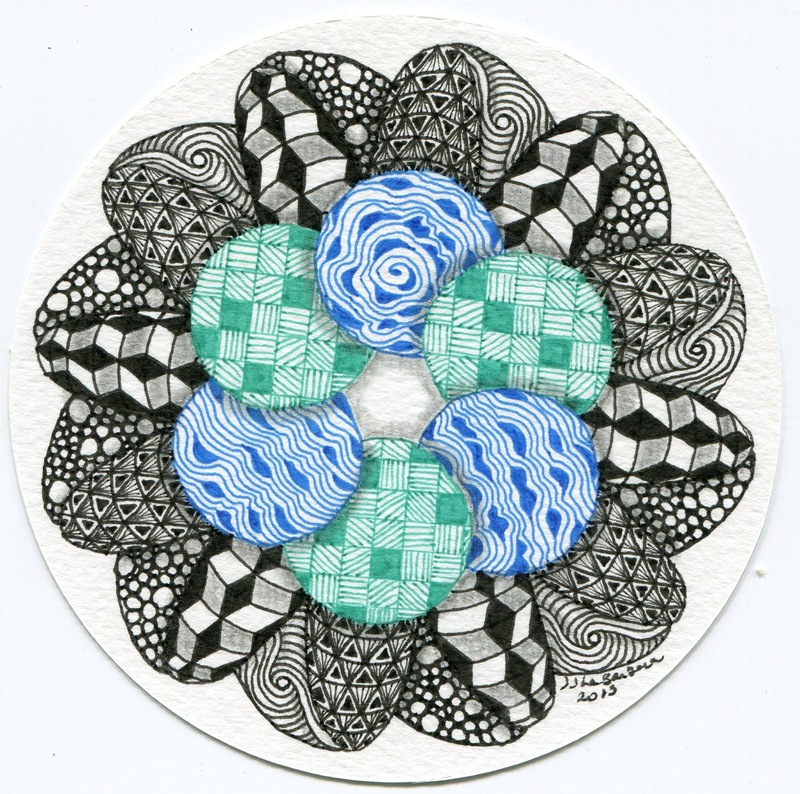 The blue and green felt really flat as I opted to not shade the patterns in the circles. Just the little shade on the edges where they overlap really popped them out and away from each other. 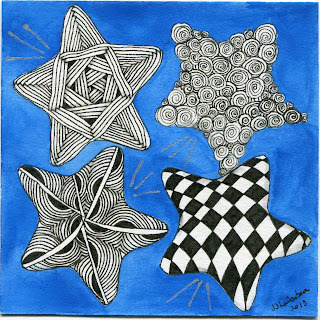 While I have your attention - if you've made it this far- I wanted to share the tile I did for last week's star theme. I did get it finished in time, but I did not blog it in time. So without chatter and more words, here are stars! Well, a little more. I used watercolor for the blue, micron pen to draw and a little silver sakura gel pen for the lines. I wanted to give the impression that the stars are shooting stars. Not sure it works as zooming but I tried! Like your Zendala. Nice combination of tangles. A great tribute to Earth Day!!! Your stars are besutiful too.